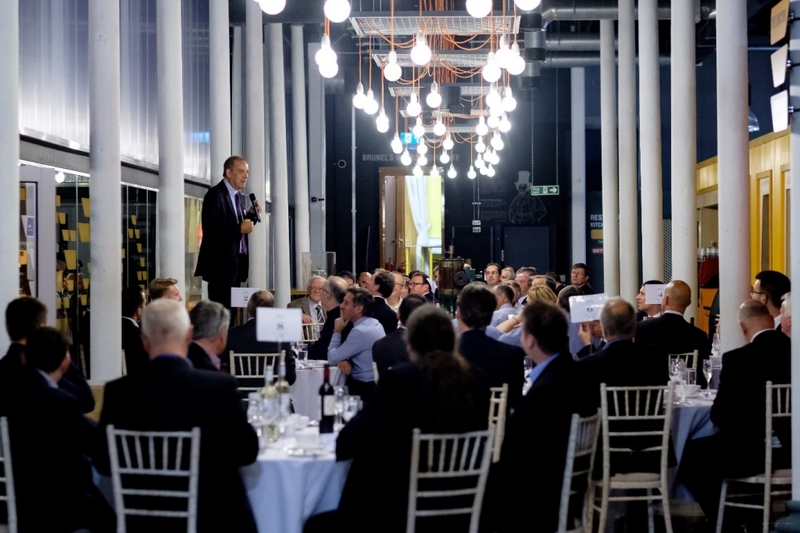 Professor Guy Orpen, Provost of the University of Bristol, welcomes guests at the Engine Shed, now transformed from a city networking hub into a high class dinner venue. 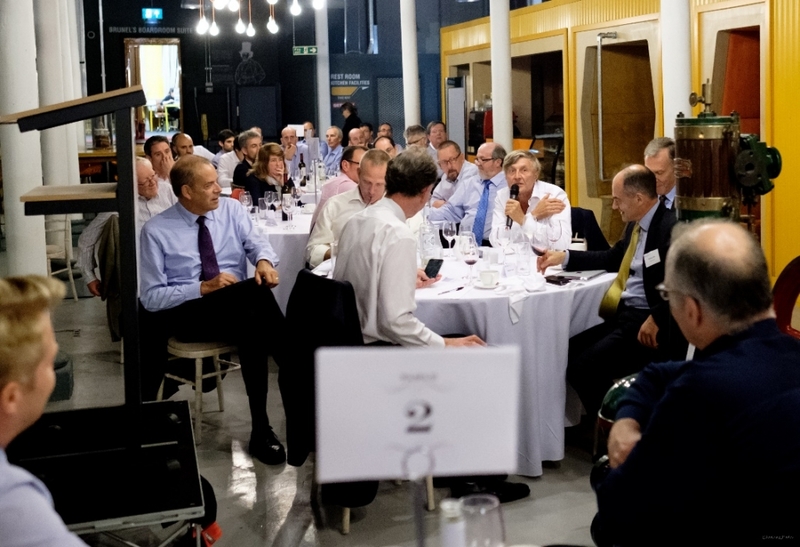 Bristol is a leading centre of the aerospace industry, and, with Cambridge, the leading centre for the semiconductor and wireless communities in the UK. 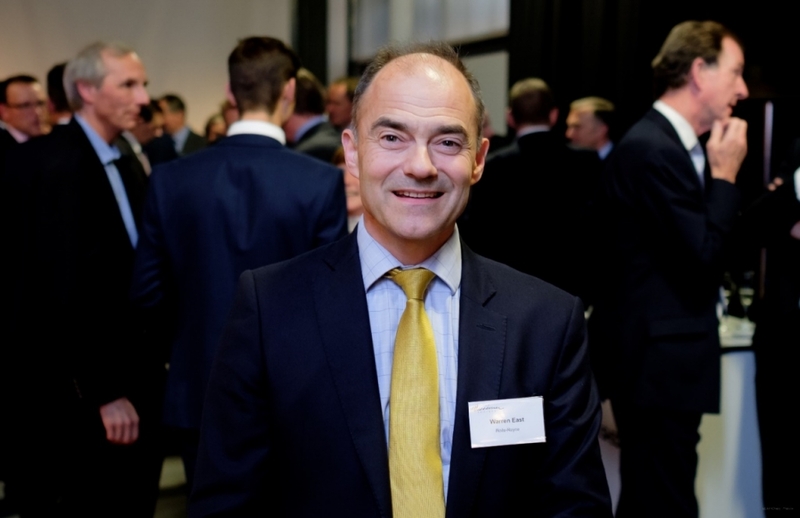 Fittingly, therefore, Warren East, head of Rolls-Royce and former CEO of ARM Holdings, was our keynote speaker. 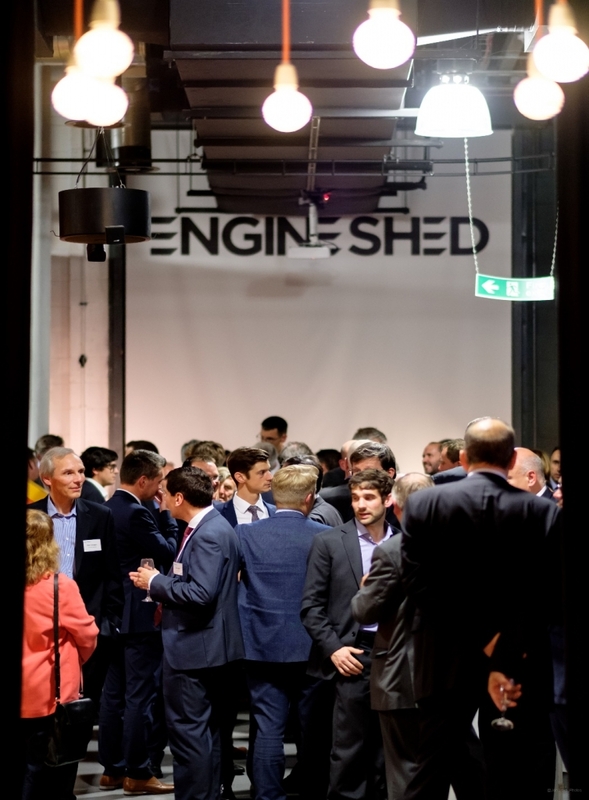 The layout of the Engine Shed proved to be perfect for the format of a Bessemer dinner evening, which is a mixture of standing networking, seated self-introductions, and dinner with speakers followed by discussion. 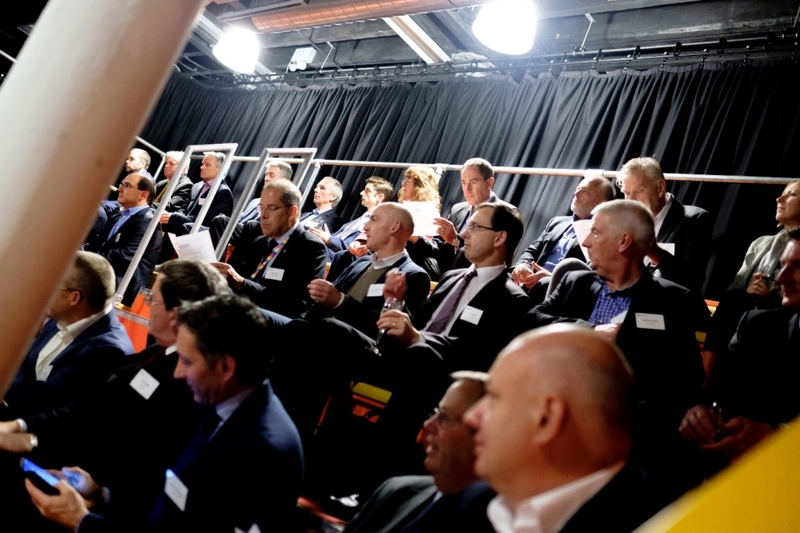 In the picture below are some of the nearly 60, mainly CEOs, waiting to hear the 12 rapid-fire presentations about exciting new businesses, such as: LEDs, 3D printers, a novel coupling device, a new engine, and smart infrastructure networks. Most of the presentations were by local companies several of whom were spinouts from the University of Bristol. Sometimes the technology was demonstrated. 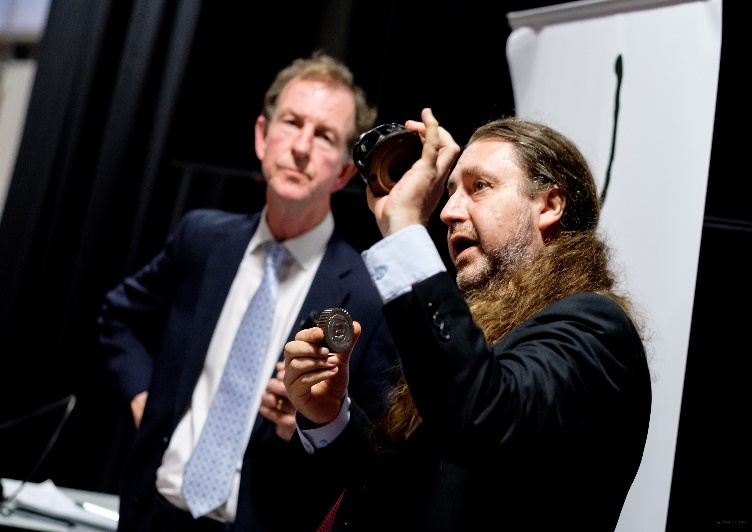 In this picture below, Simon Parker, CEO and Founder of Punk Couplings Ltd, shows one of his company’s novel torque coupling devices. The theme of the evening was scale up. The proposition was that the UK is improving at incubating new technology but still has very few sizeable global success stories. Is this due to lack of skills, or finance, or simply complacency to think big enough? We gave the floor to three speakers whose companies span different stages of development. 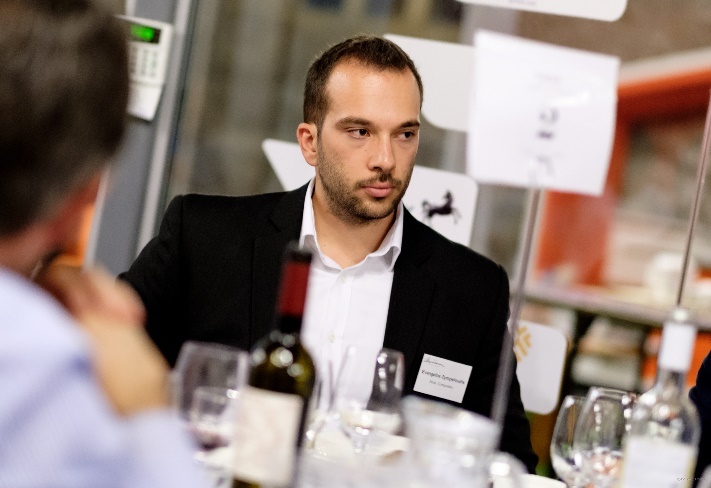 The first speaker, Evangelos Zympeloudis, is a PhD candidate at the University of Bristol. He has established one company and is planning a second to commercialise the subject of his PhD. The second speaker, Jonathan Raines, is a recent graduate of the University and member of Bristol spinout, Open Bionics, which was spun out in 2013. It is a classic disruptive industry entrant – a printer cheap enough to print your own prosthetic hand and arm – and it has attracted much interest on the West Coast. We have only a few exemplars in the UK of start up companies that have gone on to be globally dominant, ARM being perhaps the foremost example. Therefore having not only Warren East in the room, but also his predecessor and mentor, Sir Robin Saxby, the founding CEO of ARM, was a rare opportunity to hear how success was achieved, and can be achieved again. When Warren East left ARM in 2013 it was already the undisputed leader in low power microprocessors for the mobile market. In his memorable words, having nearly crashed during the dot.com bubble when it could have come under the control of Intel or Apple, it had successfully “parked its tanks on Intel’s lawns instead”. “We can do it again”, he added, referring to Rolls-Royce. After ARM he took on several portfolio positions, mainly on the boards of small high-tech companies, as well as on the boards of Dyson and Rolls-Royce. At Rolls-Royce he discovered there were many approaches that ARM had tried successfully which could be mapped on to Rolls-Royce, despite their different markets. One example he gave – an ARM microprocessor architecture and the Trent Engine both have approximately 8-year design cycles. “If it (RR) disappeared, as a country, we would struggle to recreate it… From what I did at ARM I get a kick out of it being a British company and punching above our weight on a global stage”. At dinner he described Rolls as “a minnow punching above its weight on the global stage… a £15bn breakeven business”. It is the kind of challenge he relishes’, however. Of particular interest to us at Bessemer is that he believes he can apply a startup mentality to a large-scale engineering business – and expect it to work. The perceived wisdom when he took over was that the task of competing against American and international engine powerhouses was effectively hopeless. Warren’s response to this red rag: “at ARM we had ‘traded out’ of the dot.com bubble crisis and we can do the same at Rolls-Royce”. 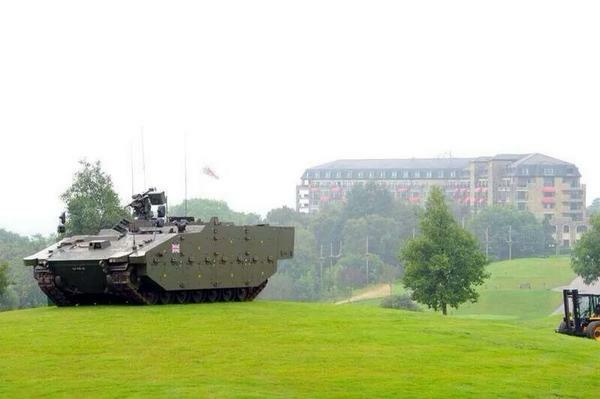 Then, he memorably added: “We will park Rolls-Royce’s tanks on GE’s lawns”. This Rambo-like statement is delivered with calm precision. Yet Warren, the man, is extremely modest. It is an intriguing contrast. For me, this statement was a key moment of the evening. Warren then went on to outline 10 keys to becoming a global success. The default position in the UK too often is to question ambition rather than to ask ‘How are we going to achieve it’. You need to have very good systems to track everything in the business. Good information. Good process. “Things get done by doing”. At big companies there is a lot of ‘activity’ (such as meetings and committees) but not enough actual ‘action’. “It’s never done until it’s done”. It is easy to report a new customer account but it is not ‘done’ until the business is actually banked. It requires a different attitude: the determination to complete what was started. “Walk quickly, but don’t run”. Pace yourself. The example of the long distance runner. The fast-paced semiconductor industry taught him to keep a steady course under the pressure of rapid change. Not having to be 100% sure before making a decision. In RR the culture is influenced by the safety-critical requirements of aerospace but this can affect (infect) commercial decision making. “Don’t be afraid to share the spoils”. The ARM eco-system is one of the great examples of a partnership community. In the case of RR, the 31 UTCs (University Technology Centres) that RR support globally have similarities. A broad outlook and lateral thinking. There is a “once in a generation opportunity” for the UK to level the playing field with the emergence of digital technologies (Industry 4.0) and 3D printing. It is easy for people in the UK to think too highly of the country’s engineering successes and become complacent. Consider Asia, China, now emerging. Some people think entrepreneurs are “chaotic and don’t mind making mistakes”, but Warren’s experience, he says, working with Robin Saxby at ARM and now as an NED on the board of Dyson is that entrepreneurs are “driven” and “focused” (they actually know what they are doing!). Finding the right pace to act in business “comes with practice”. You have to “feel it”. The customer has the money so you have to listen carefully to hear what they are saying. Listening carefully and ‘feeling’ it you can start to recognise a positive “tension” between the parties. The relationship between Airbus and Rolls-Royce operates like this, he said. There is strain (when something doesn’t go to plan) but also understanding that they have to get it right together, so it is an interdependent relationship. In the final analysis, they have to shoulder risks together. There is a lot of disruption on the way. Warren mentioned for example the impact of 3D Printing. Another area that Rolls is known to be interested in is planes powered by electricity (James Dyson has the same vision for cars, which is an interesting link). The secret of good licensing is to make sure the licensee is well served, then “a bit like a drug he keeps coming back for more”. Don’t be transactional therefore: if it is collaborative they will be less likely to become a competitor. If a trade sale exit enables a change of gear, and helps the business expand, fine, but not all exits are like that. The nationality of the acquiring company however is not necessarily relevant, it is what the money does. The mentality of venture capital is too often ‘inception to exit’ rather than ‘inception to global leadership’. More important than capital raising is raising a Purchase Order! SETsquared, a business incubation network run by five universities in Southern England including Bristol.